Let us let the photos do the talking. My overall comments are at the end. I encourage you to make your own conclusions. Conversions from PhaseOne’s CaptureOne Pro 7.02 beta (C1) are at the bottom of each set. There are a LOT of options to deal with with C1 – I ended up using something like this: Sharpening Amount 250, Radius 0.8, Threshold 0.0. No noise reduction. In Noise Reduction Advanced I used Details 50 and Fine Grain 10. The conversions for the other softwares are the same as before. I added one more comparison at the bottom – conversions from DPReview’s studio scene. CaptureOne 7.02 is good. Not super-fabulous-amazing like some on the internet have been claiming. It renders green foliage a bit better than AccuRaw. 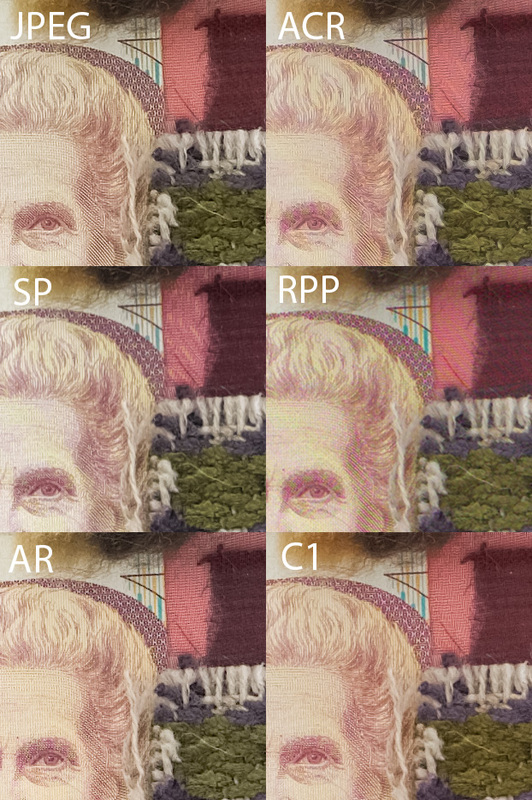 C1 is still maybe a tiny bit behind the in-camera JPEG in the foliage scenes. It does a fairly good job with the moire/false-detail suppression. 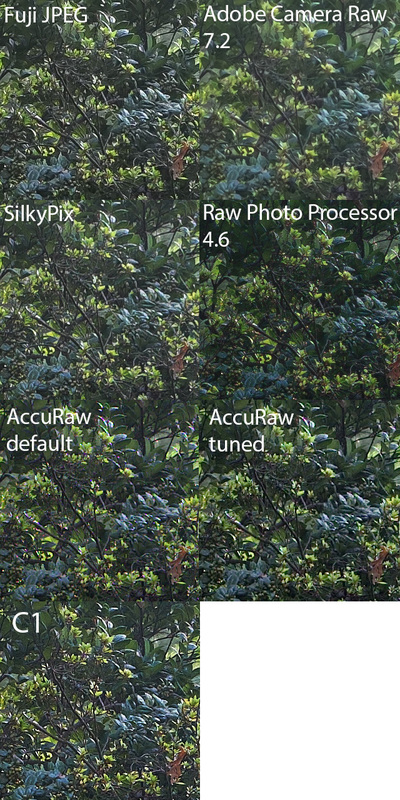 AccuRaw does a bit better on the DPReview scene at controlling the maze pattern in the red fabric in the top right. There is a moire-slider in the CaptureOne software, but it doesn’t seem to do anything in this scene. CaptureOne does a better job with the moire-control in the rooftop comparison, though. 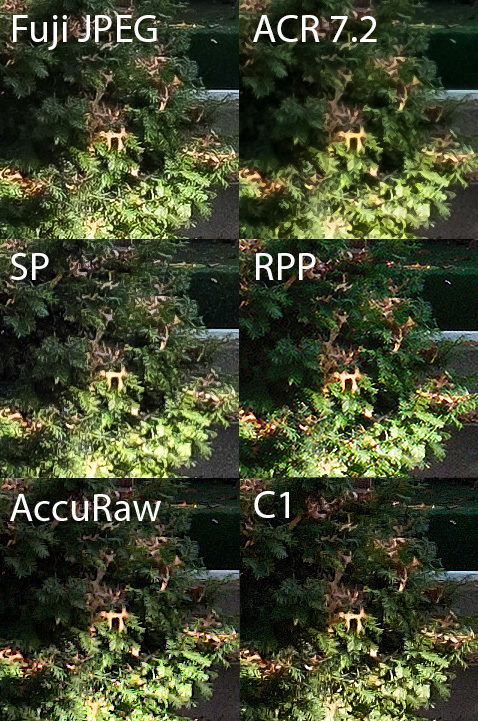 I think we’re at the point where a combo of AccuRaw/CaptureOne can effectively match the in-camera JPEG. From a long-time RAW-only shooter, it is aggravating that this has taken so long. Frankly, this has a lot to do with Fuji’s in-camera conversion being so good (unlike, say, Canon or Nikon). Fuji set the bar high and now we finally are seeing third-parties rising to the challenge.